The overall message this season is redefining contemporary dressing. And Viktor & Rolf practice this message since they started designing menswear. Their hero for the summercollection 2011 was a 1940’s moviestar on vacation at Biarritz. In his suitcase he got a streamlined suit with elongated jackets and wider lapels – sometimes in contrasting colors, piped or with sequins -, short sleeved sweaters, a bermuda and leather sandals. 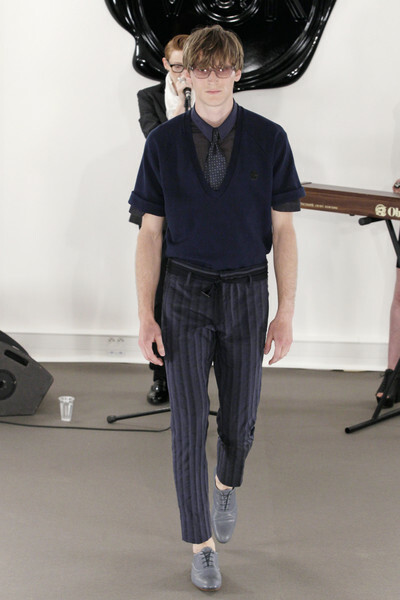 Viktor & Rolf chose typical summer fabrics like seersucker and a madras-check. Colors were kept light, as in white, chocolate-brown, blue and gray. Patent-leather shoes in blue, black and white contrasted with the beige and black/blue. La Roux said “I was thrilled to be asked to play at Viktor & Rolf’s Paris show. I’m a very big fan of theirs and for me it’s a natural fit, my music and their style. I look forward to future collaborations with them.” La Roux performed an exclusive acoustic set for the designers and their audience.